The legendary French bike brand Vitus has returned with a range of bikes for road racers and urban cyclists. Vitus (say ‘Veetoos’) might not be a name that instantly makes your ears prick up but back in the Seventies and Eighties this French manufacturer made some revolutionary bonded aluminium and carbon bikes ridden by top pro riders of the day, including the great Sean Kelly. Now Vitus is back, but this time it’s not just aiming at the big names. The line-up of bikes that we’ve seen will have plenty to interest Cycling Active readers, with both aluminium and affordable carbon-framed road bikes taking centre stage. The range starts at £649 with the Razor, an aluminium frame kitted out with a mixture of Shimano Sora and SRAM components. For £799 you can buy the Zenium, another aluminium machine, this time decked with Shimano Tiagra throughout. The bike that we most like the look of is the entry-level carbon model — the Dark Plasma — which has a composite frame, Tiagra components and a 8.5kg fighting weight for just £1,199. Look out for an exclusive First Ride in the next couple of months. 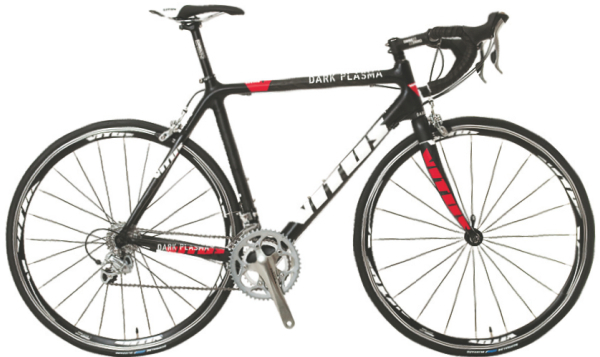 At £1,549 comes the Dark Plasma VR, which uses the same frame as the Dark Plasma but upgraded to Shimano 105 kit. And topping off the road range come two models based on a super high-quality carbon frame. The Venon VR will sell for £1,899 and is again finished with a 105 groupset, while the Vitesse VR comes with Shimano Ultegra and will burn a £2,399-shaped hole in your wallet. But Vitus is not just concerned with the road — there’s a full range of hardtail mountain bikes coming this way as well. Once more the range is headed by some exquisite carbon offerings, but we think the most interesting bike is the £259.99 VEE-1; a chunky, 26in-wheel singlespeed that Vitus calls its ‘urban attack machine’. Again, look out for a test here soon. Vitus bikes are available in the UK through Chain Reaction Cycles.